Michael Van Gerwen is the odds-on favourite to win the PDC World Championship 2018 and you can make a huge profit at Coral! Join via our special links and back MVG 33/1 to win 2018 PDC World Championship, plus £5 free bet if you lose! MVG has collected a raft of major titles in 2017 including last year’s PDC World Darts Championship, the Premier League, European Championship, The Masters, The Grand Slam and The Players Championship. Fancy Michael Van Gerwen to win World Darts Championship? Get a terrific 33/1 boost at Coral right now! Join Coral from now on to the start of the match for 33/1 Michael Van Gerwen to win the PDC World Championship 2018 at Alexandra Palace!Normal price is 4/7! Coral are offering all new customers an amazing 33/1 for Michael Van Gerwen to win 2018 PDC World Championship , click this link to get the price boost right now. 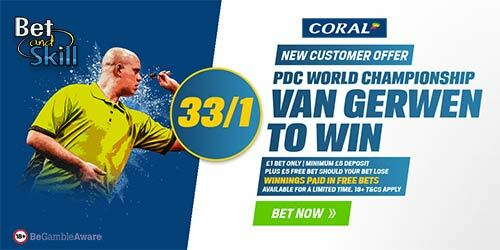 Open a new Coral online or mobile account and bet on Michael Van Gerwen to win the World Darts Championship - 33/1. Offer available to UK & Republic of Ireland residents aged 18 years or over opening a new Online or Mobile Coral account in either £/€ currency through https://promotions.coral.co.uk/landing-pages/crazy-prices2, https://promotions.coral.co.uk/landing-pages/crazy-prices-online2 or the specific offer promotion box from coral.co.uk/sports/offers between 08:00 GMT Thursday 14/12/2017 until 23:59 GMT Wednesday 27/12/2017 with the exception of new accounts depositing funds with Moneybookers, Paysafe, Neteller or Skrill. Place your FIRST real money bet as a win single £/€1 on ‘Van Gerwen to win 33/1’ in our “My Markets” sections. "Coral offer 33/1 MVG to win the World Darts Championship 2018"